Mad about birds, or just Mad? 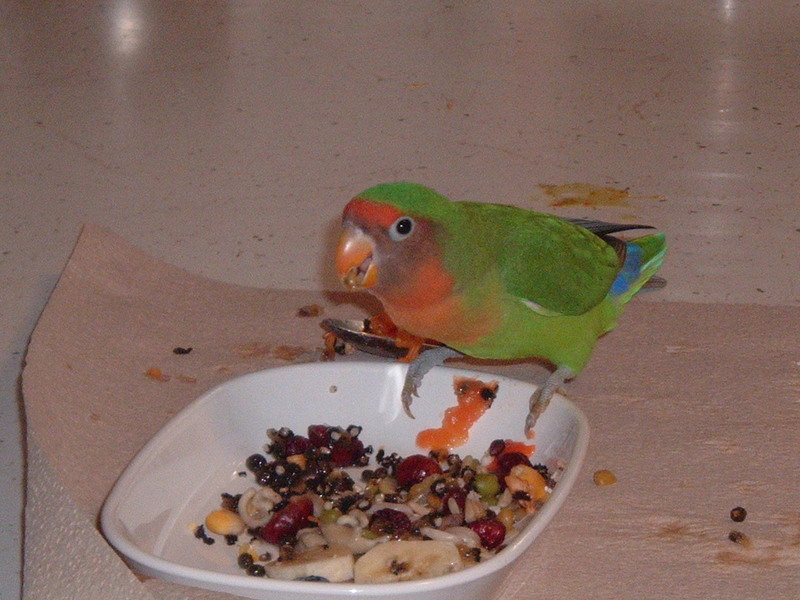 A while back, a Peach-face love bird, who looked like this lived with me for a few years. I named her Juju which is Swahili for trinket. Juju laid many eggs, and my friend Alice took the chicks resulting from those eggs and hand tamed them into loving little birds which she sold in her bird store. Eventually, Juju died from becoming egg bound, a medical condition all birds can develop, whether or not their eggs are fertile, or you are taking their chicks to hand raise. I have Juju’s first hatched chick, son Sammie, who is lime green where she was yellow but retains her peach face. His father was a blue black-masked love bird, so genetics are at work here. 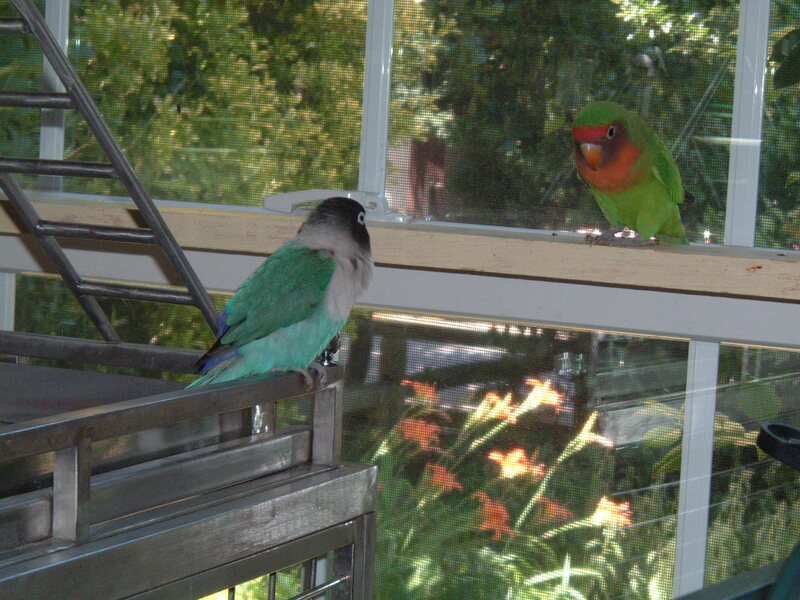 Love birds are Central African parrots and come in many varieties. People have kept love birds as pets since before Roman times. Scientists found their remains at Pompeii. I don’t know why I am mad about birds, but I am and it makes it difficult to give any of them to someone else. 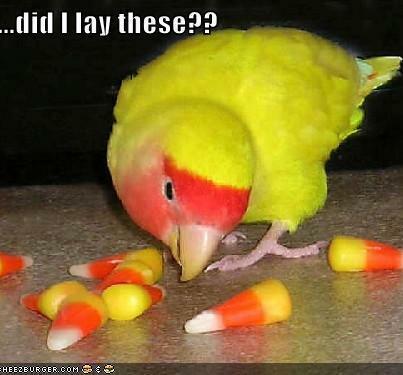 I am not a bird hoarder because I no longer add to my flock. I had 22 birds at one time and now have 7. Like my grandmother, I raised love birds and parakeets for a long time. My regret with Sammie is that I did not hand tame him when he was a young chick. No, you can’t teach and old chick new tricks. Although most of my parrots are hand tamed, Sammie is mostly wild. However, when I let him out of his cage to fly around, he always returns to it when I am ready to lock him up again. Food is a big draw, but he listens best if I chase him with a duster. Above, Eddie the daddy bird and Sammie enjoy the day lilies. I monitor Sammie when he is outside his cage, because in the past he and his partners in crime destroyed plants, lampshades, and other household items. The worst thing they did was tear up books in an attempt to build nests in the bookcases. Birds will be birds it seems and these guys are really African parrots with can openers for beaks. I don’t know why I love them. I suppose I am mad. Above, Sammie enjoys a feast. 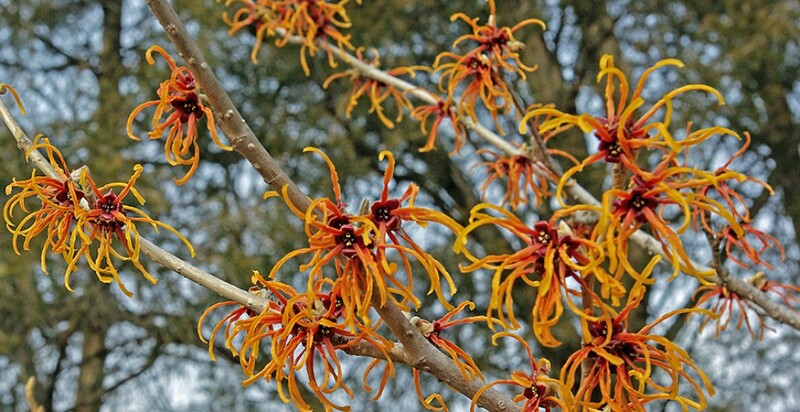 This entry was posted in Elder Blogger, Parrots, Retirement Living by SchmidleysScribblins. Bookmark the permalink. I love all creatures but have had cats more often than any other. They are endlessly entertaining and alot of company. A striped boy that I have, I believe is part Bengal ,is a hoot he chrips like a Cheeta ,retrives like a dog ,and is full of attitude. Once I got to take care of a squirrel monkey for the better part of a year, it was a childhood dream come true. I also got to pet a white tiger cub. I still harbor a wish to hug a really big cat like a grown lion,tiger panther etc. I don’t see this as a death wish…..just a unfufilled fantasy. What lovely birds and so entertaining to watch! Great shots of your bird family. Thanks so much for the pictures. Did you find the toilet brush? 🙂 And you are not mad just happy with your 7. Ha Ha. Thanks for the vote of confidence. No he never found it and he insists the cleaners took it.